UPS « Global Market Insights, Inc. 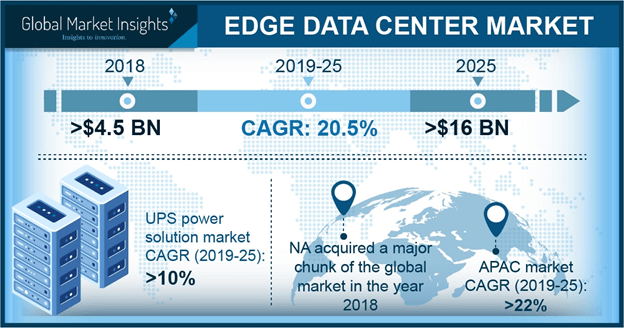 In the recent times, the global data center power market space has been witnessing an unprecedented pace of growth courtesy- the surge in the number of data centers all over the world. The amount of data that is being generated and estimated to be generated in the immediate future can be rightly termed as gargantuan. This has, in turn, assisted the prominent data center operators to expand their services and augment their remuneration portfolio in a drastic way. While it is quite undeniable that the leading end-user of data center power industry has been the private sector, however, given the rising significance of e-governance across the globe, a plethora of government agencies have been compelled to get on the bandwagon of rapid digitization. Apparently, various government bodies, it has been observed, have been making extensive efforts to consolidate their respective data centers network, a trend which would eventually quicken the pace of data center power market size expansion over the estimated timeframe. While elaborating further upon the growth prospects of the data center power industry, it would be prudent to cite an exceptional instance that would reinforce the efficacy of the aforementioned declarations. As has been reported, Eaton Corporation, one of the foremost data center power market giant has been recently awarded a USD 10.7 million contract to enhance and upgrade the existing data center of Defense Information Systems Agency (DISA) in Ohio, U.S. The Ireland headquartered firm would deploy its expertise to expand the dual power network of the data center in a bid to fortify the center’s crucial uninterruptible power supply(UPS) systems, something which would augment the efforts of DISA to increase its mission loads and cater seamlessly to its consumers. For the record, DISA is a United States Department of Defense combat support bureau which is responsible to provide communications and information technology support to national leaders such as President, Secretary of Defense, and other major leaders of the country. Needless to say, the latest contract is being dubbed by U.S. data center power industry giants as significant, given the fact that the federal government has been vigorously pursuing its targets prescribed in Data Center Optimization Initiative (DCOI), a data center consolidation programme mandated under the Federal IT Acquisition Reform Act (FITARA). As the industry players anticipate contributing toward the nation’s quest to cement its position in the global data centers infrastructure, it goes without saying that the U.S. data center power market size is set to expand at an exponential rate over the ensuing years. The burgeoning demand for cloud storage has led to a surge in the number of data centers across the globe, which has consequentially led to data center power market witness a significant boost. As per some reliable estimates, the U.S. alone has over 3 million installed data centers, with close to 10 percent of the total electricity of the nation being utilized by these data centers. Concurrently, to put the current scenario into perspective, as per some authentic sources, the data centers apportioned a staggering five percent of the overall electricity generated all around the globe. Apparently, the aforementioned statistics further affirm the need to increase efficiency and reduce the power losses as an increasing number of data center operators have been facing enormous challenges on those fronts. Leading data center power industry giants appear keen on developing innovative solutions that would not only enhance the overall efficiency of data centers but would lower the operating costs as well, thereby propelling the growth prospects of data center power market over the forthcoming years. With the tech cosmos depicting massive growth potential in the years ahead, it is anticipated that data center power industry trends would undergo remarkable alterations, which would favorably influence the revenue graph of this business space. 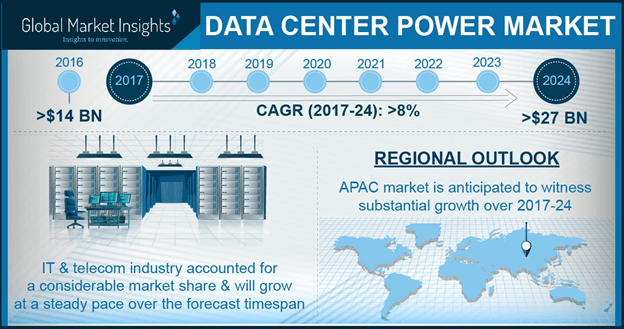 According to a comprehensive report collated by Global Market Insights, Inc., data center power market size is forecast to surpass a valuation of USD 27 billion by 2024. This entry was posted in Electronics and Media and tagged Cabling Infrastructure, Data Center Power Market, Data Center Power Market Forecast, Data Center Power Market Size, Generators, Global Data Center Power Market, Power Distribution Units, UPS. With grid connected battery storage systems getting into the mainstream power supply, stationary battery storage market is forecast to witness an upswing in the coming years. Energy storage has served as an interface between intermittent renewable power and the benefits of all time reliable, clean resilient energy supply. Utilities around the world are intrigued by the storage potential to address other needs such as releasing congestion and smoothening out power variations that occur even in renewable energy generation. One of the profound factors that is likely to act in favor of stationary battery storage industry augmentation is the unprecedented demand for electricity across the world. With the increasing global initiatives toward greenhouse gas emission abatement, a portion of the upcoming power generation should come from renewable sources. Statistics claim, stationary battery storage market valuation is forecast to take a giant leap in the coming years in terms of revenue collection, with a target value of USD 170 billion by 2030. The industry landscape is quite regulatory driven, given that the system deployment has some profound environmental impact. The stringent regulatory framework and the economic structure that needs to be abided by at various stages in energy storage systems deployments determines the competitiveness of the stationary battery storage industry landscape. Product differentiation is one of the prime strategies adopted by the stationary battery storage industry giants to sustain their position. For instance, Tesla’s lithium ion based battery storage products, ‘Powerwall’ is indeed a breakthrough in the industry. Recently, the American automaker has launched the upgraded version of the storage solution, Powerwall 2 of in South Australia, to mitigate the problem of increasing blackouts in the continent. Some of the other biggies involved in stationary battery storage market include Hitachi Maxell, Koninklijke Philips, Valence Technology, A123 Systems, and Exide Technologies. 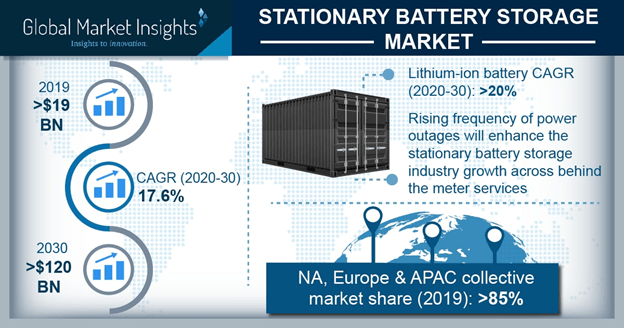 With energy crisis issue coming on board across various geographies across the world, stationary battery storage market is subsequently gaining a renewed traction. Battery technology, especially lithium ion based models have been gaining a remarkable attention of late and have progressed the furthest. Lithium ion batteries have extensively deployed in automotive and consumer electronics sectors over the recent years. As per estimates, lithium ion battery market is forecast to exceed a revenue of USD 60 billion by 2024. The growth scale certainly signals the commercialization of lithium ion based stationary battery storage market as well. Recently, in the first quarter of the year, Tesla has launched a grid connected lithium ion battery plant of 129 MWh in South Australia, which is claimed to be the world’s biggest battery storage plant. In addition, lithium ion batteries falling price trends are also expected to act in favor of stationary battery storage market expansion. Responding to the environmental call, there has been a massive upsurge in the upgradation of conventional grid network model and refurbishment projects. This positive trend is certain to drive stationary battery storage industry share in the coming years. In fact, surveys claim that emerging nations with swiftly developing residential establishments will turn out profitable for the market growth. Frequent grid failures and power discrepancies are thus pushing the demand for stationary battery storage market from the UPS sector. China, as per market experts, will prove to be a lucrative business ground for stationary battery storage market investors. A plethora of factors that can be placed behind this forecast include extensive commercialization, growing regional population coupled with surging demand for power, and Chinese government’s huge investment in grid upgradation. For instance, in 2017 China had decided to spend approximately USD 360 billion on renewable power technologies such as wind and solar by 2020. China Energy Storage Alliance (CNESA) in their recent report has forecast that the country will undergo a chain of trends in the coming years, pertaining to the energy industry, which undoubtedly will leave a perpetual impact on the regional stationary battery storage industry. The U.S. belt has quite actively responded to the rising environmental needs, owing to which the region is forecast to be a potential business avenue for stationary battery storage industry. Driven by the refurbishment of current electrical networks as well as the launch of sustainable building codes and standards, the United States has been touted to emerge as a viable revenue pocket for this business space. Another major driving force of the U.S. stationary battery storage industry is the increasing power consumption along with the pivotal upsurge in infrastructure development investments. In addition, the launch of highly favorable policies for the development of large scale energy storage projects will also augment the regional industry landscape. Say for instance, in the year 2017, December, the NY government declared numerous regulations targeted toward an energy storage deployment target of 1,500 MW by 2025. Though stationary battery storage industry is forecast to penetrate most of the emerging nations across the world, the growth curve will vary significantly on a global level. A large number of factors that are underlining this growth variation as per region include regulatory landscape, grid infrastructure, supply framework, population demographics, and energy demand. However, keeping into consideration the aforementioned aspects, stationary battery storage industry is set to exhibit a lucrative road map in the coming time frame, with a remarkable annual growth rate over 2019-2030. This entry was posted in Sustainable & Smart Technologies and tagged Communication Base Stations, Emergency Power, Flow Battery, Lead Acid, Lithium Ion, Local Energy Storage, Remote Relay Stations, Sodium Sulphur, Stationary Battery Storage Companies, Stationary Battery Storage Market, Stationary Battery Storage Market Forecast, Stationary Battery Storage Market Size, Uninterruptible Power Supplies, UPS.